1. 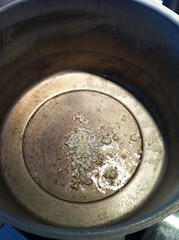 Heat the oil in a pressure cooker and fry the garlic until just browned. 2. Remove the pressure cooker from the heat. 3. 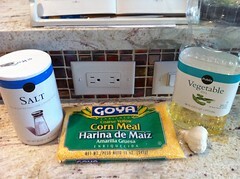 Add the corn meal to the pressure cooker and toss in the garlic and oil. 4. Add the salt and water and mix well. 5. Place back on the burner, on high heat. 6. Close the pressure cooker. 7. When the pressure sets (nozzle cover starts to rattle), turn heat down to medium and cook for 15 minutes. 9. When the 15 minutes have passed, turn off the heat from the pressure cooker. 10. When the safety valve releases, open the pressure cooker. 11. 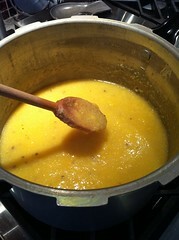 If the harina is still runny, turn the heat back on - to low, or simmer - in order to let the excess liquid evaporate. 12. When you have a thick consistency, ladle a layer of harina into a greased pyrex. 13. 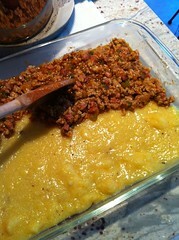 Ladle a layer of picadillo over the layer of harina. 14. 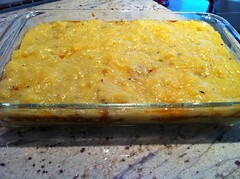 Top with harina to form the final layer. * Note: let cool between layers. This dish can be served immediately, which will be more runny. It can also be served at room temperature, which will be more firm. Cristina, any idea how long it takes to make the harina if you don't have a pressure cooker? Don't have one and it will be a wild goose chase up here in New England to find one. I, too, am interested in knowing if there is a way to make this without a pressure cooker. Suggestions? So sorry for not responding to the first comment. I haven't made it without the pressure cooker but it may be an hour or so to let the hating thicken and cook. I'd cook it for the first half hour, covered, over medium and then see how it looks. 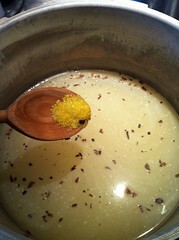 If it needs to thicken, then uncover and stir while checking for thickness. Please let us know how it turns out. Good luck! I always make it without a pressure cooker and it's not that long. It can take 40 minutes max. You just have to keep stirring - look up a recipe for polenta. It's very similar.